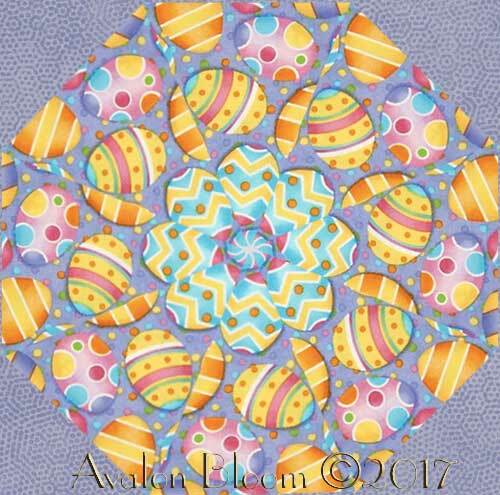 A sweet Easter print from the Henry Glass designer, Shelly Comiskey, who is always a favorite with quilters. Easter eggs in all manner of Easter beauty with chevrons, stripes and dots that make you wish it was Easter all year long. Colors Include, cheerful yellow, fountain turquoise, cheery pink, and navel orange on a dahlia purple ground. 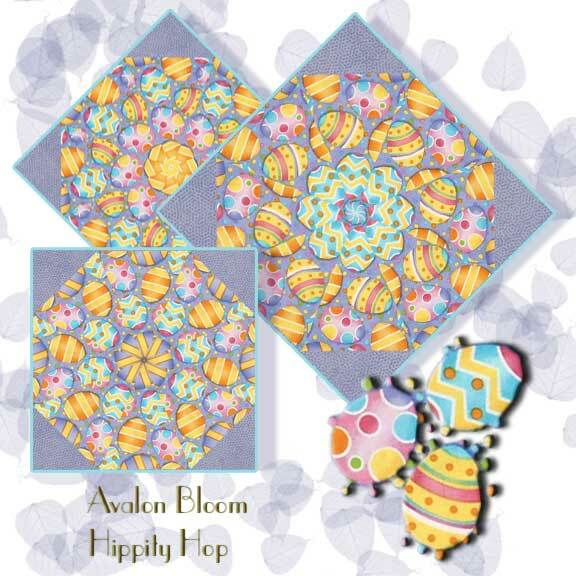 Pattern 6681-55.This is a kit to make 12 kaleidoscope blocks. Finished dimension for all blocks sewn together is 24 X 32 inches. Each block measures 8 1/2 inches square when sewn. Our Fast and Easy Blooming Blocks© are cut from 100 percent cotton fabric. Each block in the set will be uniquely different due to layering the fabric in exact repeats to create a kaleidoscope effect by precisely rotary cutting them.They are specially cut so that the centers will lie flatter and so there is no bias on the edges of the block so they lie flat in your quilt. You can put these blocks together in a quilt in different ways. Illustrated instructions included to complete the blocks that even a beginner can understand as well as bonus instructions for dimensions to include these blocks in a King, Queen, Double, Twin or Baby Crib, wall hanging quilt as well as a Table Runner or Placemats.